I'm at Olney Business Live on the 24th if you'd like to see my new magic trick. It's certainly not my original idea, but that doesn't matter, it's done, and last night I tried it out in front of a 'live' paying audience, and the looks of astonishment on their faces made me realise it was a sure winner. The basis of it is that I get an audience member to sign a standard playing card, and it appears from somewhere else immediately. "That's all I shall tell you about it." Trade shows are always looking for original ways to bring the buying public to their stands, and this is one of the reasons I worked on it for so long, so I'm not going to give the secret away anytime soon. What happens at trade shows is that a magician will turn up and stand with them and chat to the public and then show them one brilliant gag, which intrigues them so much, that they go on to the stand. With this kind of event, you're not expected to do a show as such, it's just a matter of being able to chat to anyone and then pull a stunning and impossible magic gag out of the hat. Of course, you need to design the trick around the company you are representing to a certain degree, and this is what I've done because any kind of card can be used, such as the company's own business card. The routine I normally do at a dinner or similar function is a 'broad base' of gags, some of which are quite tricky, but fun none the less. I've always worked it into a comedy style routine rather than one where I try to get the public to believe in what I'm doing. Part of the success of this is to get there early to set a few things up and to think through what you will do. A good table magician will have about 6 tricks to hand. I tend to bring along some children's ones as well, as the customer is always terribly pleased if children attending are kept busy by a magician. Youngsters just love things that disappear and reappear, which I'm a bit of a wow at with everyday objects. Teenagers are harder work as they don't really want to be impressed but once you get them in are great. I tend to explain one to them at the end and give them a simple trick to take home. That usually wins them round. Older people you just need to judge. Some like tricks and some will try to catch you out, but that's part of the game and easy enough to cope with if you're confident. "Anyway, this is just to let you know that amongst the good gags I have, this new one is a real finisher." On the 24th May I shall be at the Olney Chamber of Trade Business Event - Olney Business Live - at The Carlton House Club in Olney, where companies will be displaying from 13.00 - 17.00. 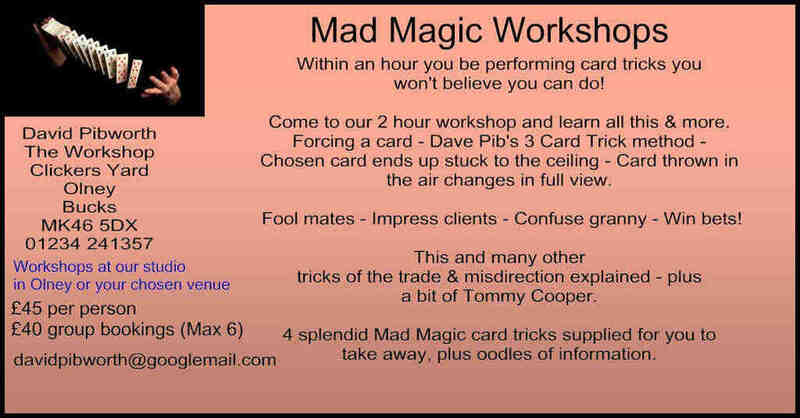 I shall be there with some of our staging (also for hire of course), with the new trick which I will be happy to demonstrate, and also I will show you other magic which you can learn to impress customers or just to take up as a hobby. Magic is a damn fine hobby to take up, as you can get many rounds of drinks bought for you if you wander into a pub and do a really good - and quick - trick. Of course, I'm also available for the Mad Magic workshops, and will be happy to travel to you to run it, or you can come to our offices.